Delta Marine's latest top-secret motor yacht, the 53 metre Project 174046, has been pictured for the first time moving between sheds at the American yard. This high-performance motor yacht will feature a semi-displacement aluminium hull and composite superstructure, with styling inside and out by Jonathan Quinn Barnett. 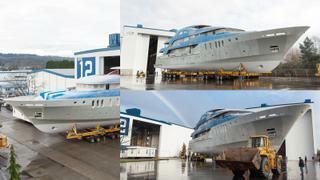 As the pictures below reveal, the yacht is structurally complete and ready to be faired and fitted out. He added that the design balances the need for impressive interior volumes and 2.1 metre headroom with a sleek, aerodynamic profile. The yacht’s extensive use of glazing, both in the windows and windbreaks, means unobstructed sightlines for great views out to sea. 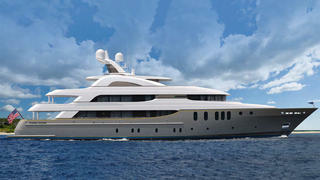 “We have maintained the elegance of a long, low yacht that is more hull in appearance than house,” Barnett added. Accommodation is for up to 12 guests in six staterooms, including a full-beam master suite on the main deck and a bridge-deck VIP. Meanwhile, the crew quarters allow for a staff of up to 12 people. 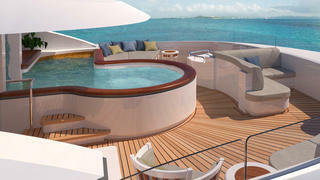 Exterior relaxation spaces include numerous al fresco dining spaces that can host up to 14 guests at a time, and a superyacht sundeck that is split between shaded and exposed areas, with a four metre teak bar, a waterfall-fed swimming pool. In keeping with the client’s brief for a high-performance yacht, Delta will be fitting twin 3,860hp MTU 16V 4000 M73L engines that will draw on a total fuel capacity of more than 94,000 litres, making extended cruises possible. Other superyacht projects currently under development at the American yard include a recently launched 63 metre project, which is due for delivery before the end of the year.